My eating habits put me in the de-facto vegetarian camp. More often than not, if I’m eating, you’ll find me crunching away at some root, flower or fruit. This has been the case for so long that, each time my father sees me, he comments that my ears look a bit longer, and asks if I’m sure I haven’t sprouted a tail. What a funny one, that fella’. Sometimes, though, even us vegetarians-by-habit are overwhelmed by dietary deficiency. Our bodies’ ancient hunter-gatherer metabolic pathways, awakened by vegetable-laden circumstance, signal a solid cut of meat is the only relief for our psychic disquietude – and like Christopher Walken & his Blue Oyster cowbell, it is simply all that will do. After all, proteins are the building blocks of life, and most people in the know admit that you can’t really be fit absent your fair share. Moreover, who am I to ignore the signals my body sends me. I’m vain, like everyone else, but not so much to think my ideas are wiser than nature’s wordless ways. So, every now and again, I’ll stoke up the grill, and char some beautiful cut. Like in other visceral affairs, I’m a leg man – always have been. This probably came from my father too. I still remember him cooing in awe at the pepsi girls surrounding Ray Charles on those old tv ads. What can I say, the apple hasn’t ever fallen far from the tree. A good leg cut of meat really is probably the best, regardless of the beast. They are well marbled, and a lot less tough than shoulder cuts. That means you can enjoy the wonder of outdoor grilling, and char-grilled flavors, instead of having to slow cook your dinner for 12+ hours. Don’t get me wrong, slow braised, fork tender roasts are always a treat, but, who ‘s got the time or foresight? On the other side of the plate, leg cuts might not be as tender as fillets, but they always have a heavy fat content that surely makes up for it. Let’s also not forget that fillet is within far fewer people’s budgets than any thigh. Meeting budgetary concerns is, obviously, always a plus. Unfortunately, lamb is probably my favorite meat, but a leg of lamb is a monster cut, not to mention typically on the steep side of my wallet. As I’m typically cooking for one, maybe two, whole legs of lamb are excluded on account of these considerations. Oh, but did I ever count my lucky stars when, struck with my most recent protein craving, I spied, on Trader Joe’s shelves, packages of lamb leg STEAKS. This, my dear readers, was the cut of my carnivorous pauper dreams – the superiority of a leg cut, the amazing flavors of lamb, and no problem with buying 20 times more meat than I needed. Might I add, they were selling these steaks for 6 bucks a pound? Compared to other meats, that really isn’t so dear at all. Now, a lot of people don’t really fancy lamb, finding the taste just too gamy. Personally, I don’t mind gaminess at all, and sometimes even go in for it on purpose. But, the most important part of good cooking is sharing with people you love. On account of this axiom, we have to find ways to satisfy all palates, if we really want to enjoy fine food. 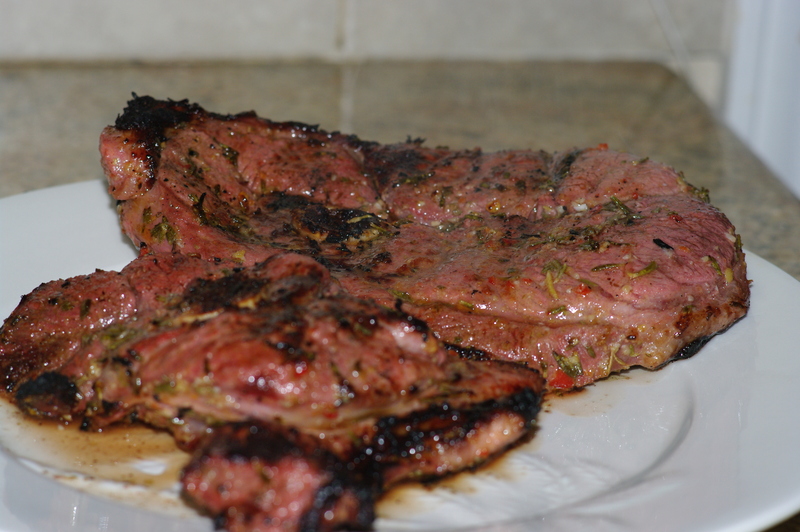 This marinade for lamb, is a classic. I inherited it from my mother’s repertoire, and I think it works brilliantly at countering the natural gaminess of lamb. Forget mint jelly, that mess is just a mask – this is a foil. Not only is it a complement to lamb’s amazing natural flavors, it is très facile, aussi. 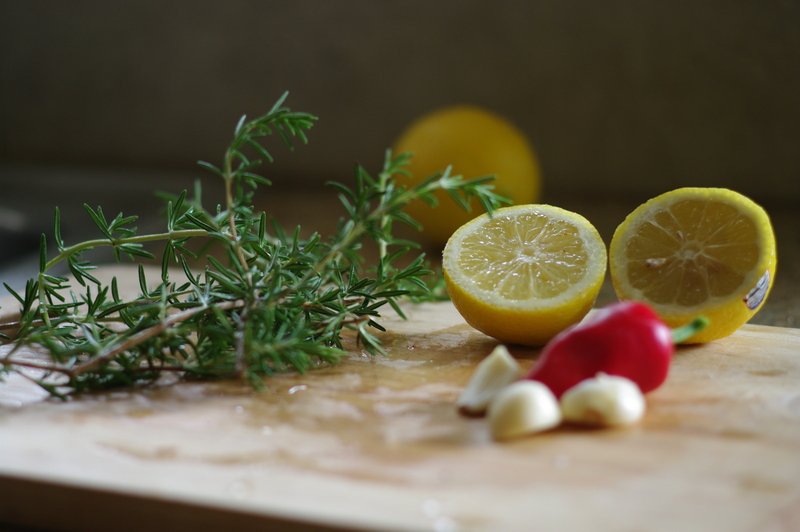 The marinade is a simple blend of rosemary, lemon, garlic, and olive oil. And, I bet you all guessed it already, I added a fresno pepper for a good measure of piquancy. That bit is only needed if you like the heat though. Feel free to exclude if you prefer the mild. Remove the rosemary needles from their branches, and chop as finely as possible. Save the twigs to throw over the coals, as they’ll provide a nice rosemary tinge to the smoke flavoring the meat. Mince the garlic and the fresno pepper. Juice the lemons. Mix all of the ingredients, except for the salt and pepper. 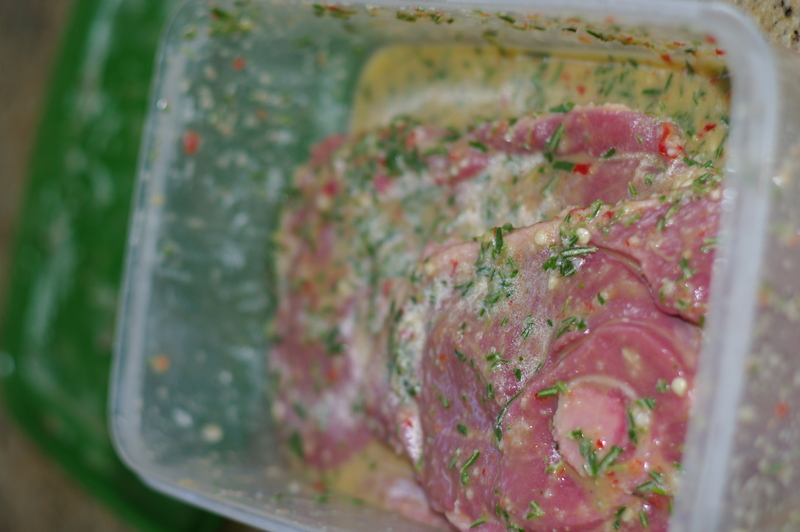 Place the lamb steaks in a plastic bag, or container, and cover with the marinade. Let the meat marinate for at least 5 hours, but no more than overnight. Pile the coals in your grill in a pyramid, and light them. Let the coals get very hot, once they are all evenly covered in white ash, they are ready. Break the pyramid of coals down, and return the grill surface to the barbeque. Let the grill itself get hot, then sprinkle each side of the steaks lightly with salt and pepper. 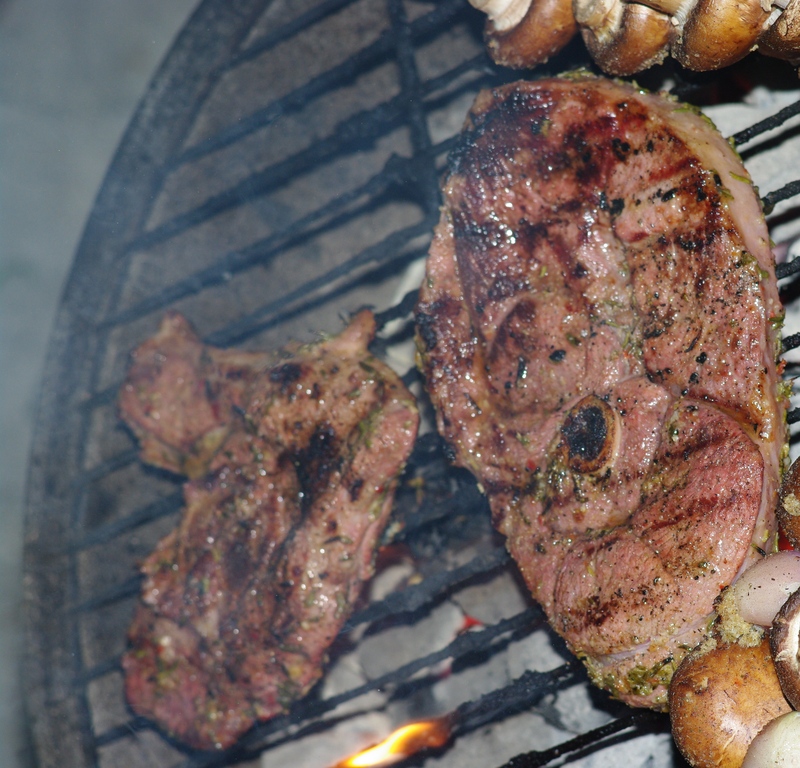 Place the lamb steaks on the grill. Cook the steaks for about 5 minutes on each side. Mind you, 5 minutes a side is with a very, very hot grill. I normally prefer my meat very rare, but lamb is better served medium rare. 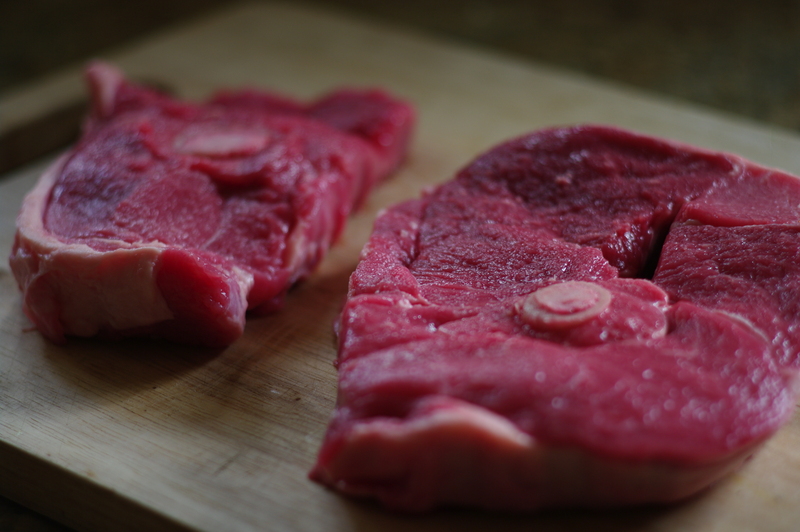 Depending on the heat of your grill , and how well you like your lamb, adjust the time on the heat. Much more than 10 minutes on each side will, however, likely be too much. This entry was posted on September 19, 2010 at 8:39 pm and is filed under Entrees, Lamb. You can follow any responses to this entry through the RSS 2.0 feed. You can leave a response, or trackback from your own site. Thak you for the accolades. This looks simple delicious. My friends and I Are definitely enjoying your blog. Maybe as it grows it can become a cook book.